Above is a new architecture of the transistor which is applied in high voltage vertical FET (HVVFET ™) to achieve high operating voltage and very high power packaging density. 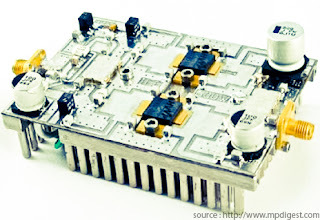 This approach offers many advantages to designers of power amplifiers. High voltage solutions help designers to simplify the matching circuit discrete devices. Achieving high power through the device causing high voltage impedance level, allows the network to the appropriate circuit with fewer components smaller area. As a result, a series of matching not only the smaller, less expensive solutions, but offers higher reliability as well as there fewer parts with the potential to fail. This circuit is suitable also show less loss than a low impedance solution that has a higher transformation 50 ohm impedance ratio desired.